Although this recording would make a very acceptable recital of music for harpsichord and organ (and occasional violin) there is far more to it than that. In fact, unless you already know what a partimento is, I suggest you have a listen before you read any more, because what I am about to reveal might surprise you, given the nature of the music you will hear. You can find extracts of all the pieces here, but I particularly recommend the first and the fifth one on the list – Paisiello’s Partimento in D and Durante’s Intavolatura in A minor. If you took my advice and listened before reading on, and are wondering what I am going on about, there is a clue in the video here (Paisiello’s Partimento Fugue in D) where, from 55 seconds in, you can follow the score of the piece being played. Incidentally, it is performed by Nicoleta Paraschivescu on one of the most famous historic organs in the world. The score only has the bass line, together with a few obscure looking markings. Partimento is a method of using the Baroque concept of continuo (figured) bass for teaching purposes. It started in Naples in the late 17th and spread throughout Italy and beyond up to the 19th century. Rather than using the bass line to create a continuo accompaniment, partimento required students to compose complete pieces from just the given bass line. 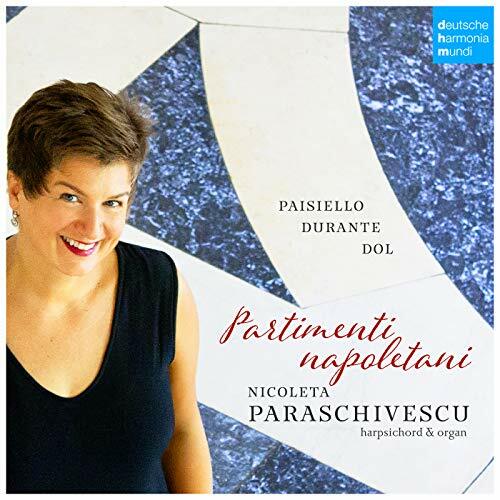 For this recording, Nicoleta Paraschivescu has created her own realisations of partimenti from the 1782 Regole per bene accompagnare il Partimento by Giovanni Paisiello (1740-1816), together with examples by his teacher Francesco Durante (1684–1755) and one by Giuseppe Dol (d1774). The results are a fascinating sequence of short pieces in the wide range of styles represented by the partimento technique, ranging from symphonies, overtures, concertos, arias and cavatinas, sicilianos and fugues. Two Paisiello pieces are included, La Partenza and a Rondo, with a violin, played Katharina Heutjer. In the first, the harpsichord is the dominant instrument, in the Ronda the violin takes precedence. The harpsichord is a copy by Keith Hill of a 1735 Blanchet instrument, and was recorded in the attractively resonant acoustic of the Großer Saal of the Musik-Akademie Basel in Switzerland. Four of the pieces are played on the magnificent 1761 Gottfried Silbermann organ in Arlesheim Cathedral, a few miles south of Basel. The performances are excellent, the music varied and entertaining, even without the musicological interest of a lost teaching practice. A few of the pieces are in rare surviving contemporary realisations of partimenti. The music is in the style expected from the dates of the composers, generally representing the period of change from Baroque to early Classical. They range from less than a minute to around 5 minutes in length. Detailed information is given in the programme booklet here in German, English and French and there is more information, including scores, to be found here. There is a video introduction here.